Tips for creating a successful campaign for real estate. Setting up a Google AdWords account for PPC marketing is actually quite easy. The link will take you to where you need to start, and it won't cost you anything until you place ads and get clicks. The real issue for many real estate agents who find PPC not so great is that they get started without a comprehensive plan for success. You see, the logical approach seems to be starting with setting up the account and campaigns. But, you really shouldn't be doing that until you have your site and lead generation ready. You start at the tail end of the process and work backward. Doing this right will result in immediate clicks through to the site, visitors who find what they seek, and real qualified leads. Let's work backward to see how we're going to make it happen. You do not want any of your ads linked to your website homepage! That's not going to get you leads, and it's going to hurt your "ad quality score" with Google and run up your cost per click, CPC. You're creating content, and you don't want to stop doing that. However, start thinking of your site content in more tightly focused topics. Throughout this article, our example will be the desire to generate a buyer lead in a specific neighborhood, let's call it "Morningside." It's a large subdivision where you specialize in helping buyers and sellers. You may, or even should, have several articles or pages of content about Morningside, but for our example, we're going to work on "Morningside Subdivision Homes for Sale" for our title. We're going to create a page with some very specific information about this neighborhood, what makes it desirable to buyers, and why you're the agent to contact. You're working the title as your keyword phrase as well. It's the phrase you'll set up in Google AdWords for your ad to draw potential buyers. We're going to get them to this page with our ad, but if we don't get them to provide their contact information, we're spinning our wheels. Let's create a historical Property Sold Report from the MLS for this subdivision. It can be made into a PDF file and set up for automated delivery if they fill out a form with their contact information and email address. We move them to take action in our page content, as we're telling them that knowing what has sold and for how much will give them a leg up in negotiations. You want them to see the value in getting this historical sold property information, and to fill out the form to have it delivered via email. We're doing something different than many of our competitors are doing with AdWords. They are putting up ads and bringing traffic to their home page. There the visitor is still seeking specific information and will have to do so using site navigation. We're creating a destination specific to their question and search, and then offering them valuable upgraded information for their contact info. Why would we want to have an ad bringing a visitor wanting to know about "Morningside homes for sale" to our site unless we bring them to precisely the information they want? Now that we have our landing page created just for this ad campaign, we know they will go directly to the information they want. Google tracks their time on site and clicks activity, so Google's data will be able to tell that they are happy as well. The special report offer is our call-to-action, and it's how we'll generate the buyer lead. They find what they want, read all about it, and see a valuable extra report that will give them sold property information for the area. 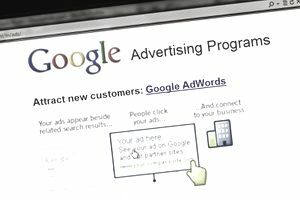 Working from the end back to the front is how to create your successful Google AdWords campaign for real estate.